A once thriving hot springs resort that featured a dance hall that superseded the popularity of the hot springs itself. When purchased in 1962, by a family with mining interests, Lidy was sadly converted into a mining material processing plant. 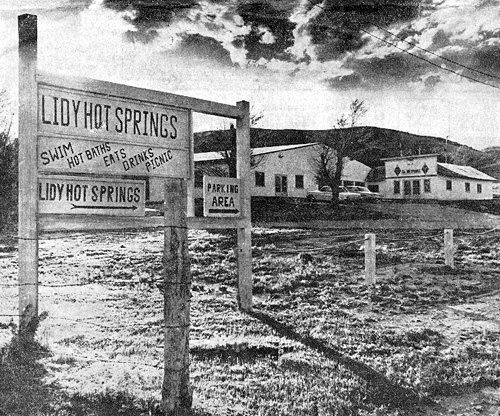 The complete history (w/ photos) of Lidy Hot Springs is available here. NASA visited Lidy in 2002 to study Archaea microbes; a single-celled bacteria that live in the depths of some hot springs - most prevalent in Idaho hot springs. Archaea microbes are the only form of life on earth (did you get that - ONLY) that can survive without carbon and sunlight. Then, how pray-tell, do Archaea acquire energy? Hydrogen gas. View information about the NASA Microbe study here. Prior to 1962; resort buildings, dance hall, bar, food services, live music, private soaking pools and a large, covered hot springs swimming pool. Use the interactive Google map below for driving directions. Note that this hot springs is not open to the public. Please do not enter private property without the owners permission.